These are just a few questions me and my staff in the University of Missouri Financial Aid office hear every day. Prospective and current students are overwhelmed by the financial process and scared of leaving college with too much debt. Their questions make sense, and their concerns about student debt are definitely understandable. But, far too often, students miss opportunities to get money for college and make other financial mistakes that lead to the over-borrowing they were scared of in the first place! Here are six of those financial aid mistakes. Avoid these pitfalls so you don’t over-spend and over-borrow on your college education. Not over-borrowing on your student loans starts with reducing the amount you owe in the first place. And your first step in getting money for college is filing the FAFSA. It’s the Free Application for Federal Student Aid, and it unlocks government grants (which are free money for college) as well as more favorable student loans. Many colleges and universities also use the FAFSA to award their own institutional financial aid. You have nothing to lose and everything to gain by filling it out. Do so. Yes, scholarships take some work. They require planning, time, and in most cases writing yet another essay. But scholarships are free money to attend college, and certainly an hour or two of your time is worth the hundreds or even thousands of dollars you might win with a single scholarship. Best of all, scholarships are everywhere! Churches, community organizations, local government, philanthropic foundations, and more offer scholarships in the hundreds to thousands of dollars. Some are based on academic merit while others are based on extracurricular interests, demographics, geography, and more. There really are scholarships for everyone (seriously—everyone). All you have to do is apply. Creating a budget—and actually sticking to it—is the #1 piece of advice from financial experts. Trust me, budgets work. So sit down with your family, look at all of your finances, review your college financial aid award letters if you have them, and make a budget ASAP. Make your spending rules easy to follow, and look for an accountabilibuddy (like your roommate) if you can! It is critical that you understand your financial aid awards and any student loans therein, plus the repayment terms of any outside student loans you may end up borrowing. You should know exactly when your first loan payments will become due and how much you will owe. If you are borrowing to buy Prada when you can afford nada, you are going to have a bad time. Financial aid is available to cover your education, books, room and board, tuition and fees, and even reasonable costs for eligible study-abroad programs. It is not for extravagant purchases or vacations. Wondering how you’re going to cover that spring break trip to Cancun? Start a savings account. The advisors in your college financial aid offices are there to help you. (At the University of Missouri, we match every student with a financial aid advisor, so they can get one-on-one guidance from the same person throughout their academic career.) These financial aid reps have heard all the questions—and seen all the mistakes. 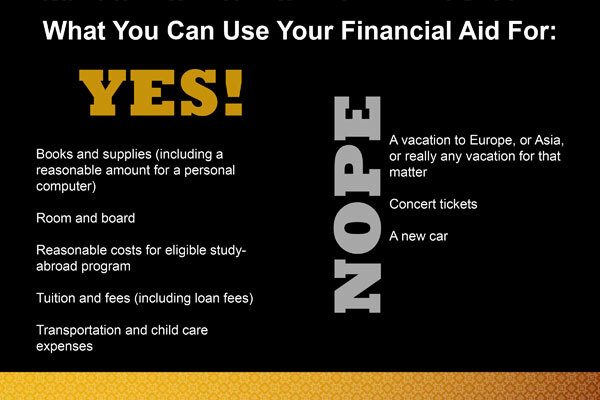 They will help you navigate the financial aid process, so you can make the best decisions for you. Nick Prewett is the Director of the University of Missouri Office of Student Financial Aid. He holds a doctorate in higher education administration.